Dunedin, a city we almost didn't visit because of routing inefficiencies, was a highpoint for our South Island tour. The hilly university town of 120,000 people on the southeast coast had a welcome, lively energy and no doubt the unusually fine weather colored our experience. 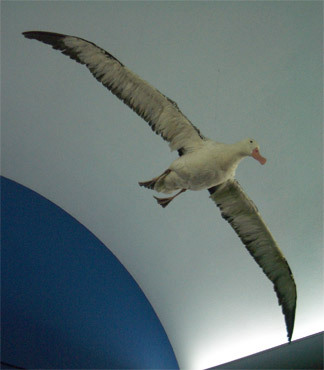 This stuffed albatross was easier to snap than the live guys. The Otago Museum--which was what pulled us into Dunedin--was well done and had satisfying and sophisticated exhibits to round out our New Zealand education. The next stop in Dunedin, the visit to the Royal Albatross Colony was interesting, though felt overpriced at $30NZ each for a tightly controlled 30 minutes on the viewing platform. But our early February visit to the colony was perfect for spotting several birds nesting on their chicks--a special treat with birds that only make landfall to breed. And we were lucky as we were the first in the stream of visitors for the day to actually see birds in flight flashing their 10' wingspans. The unexpected delight in Dunedin was the time spent with Elm Wildlife Tours. They hauled us out to the Albatross Colony as part of the package and then on to a private conservation area they developed with the farmer who owns land favored by the local wildlife. There we walked on the beach between the resting sea lions, got up-close looks at yellow-eyed penguins from hides, and looked down on several hundred fur seals with their pups. Our tour leader, like most of their half-dozen guides, was a master's level biology student. 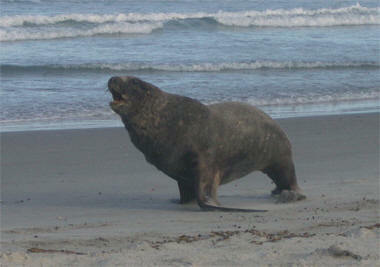 Sea lions were his area of study and he was personable and generous with his knowledge. Of our half-dozen guided tour experiences in New Zealand, this was the cheapest at $75NZ each and unlike all the others, felt under-priced. Our Dunedin small group wildlife guide also happily answered all of our questions, including clarifying that part of our misery on the road as cyclists was because in New Zealand cars have the right-of-way over pedestrians and cyclists. I asked our Elm Tours guide if there was momentum building in the country for supporting cycling and he hardly understood the question. The rising cost of petrol had increased biking in the cities for commuters, but he thought there was no need for that in Dunedin. Within Dunedin as in several other cities, we did happen upon nice urban bike lanes but the mindset had not yet spilled over onto the intercity riding. And it was in Dunedin that we listened to the frustrations of several British cyclo-tourists with biking in New Zealand. One energetic couple that had done 2,000 miles in 2 months--about what we'd done in 3 months--was hopping mad. The husband was intent on a letter writing campaign when he returned home to complain of the mistreatment of cyclists on the road. About our age and like us, with plenty of touring experience in other countries, they were applauded at what they had experienced. We however consider the situation for cyclists in New Zealand as hopeless and hearing that cars have the right-away over pedestrians just confirmed the unsuitability of the culture for cycling. Sea lions pelvises tilt so, unlike seals, they can walk on all 4's. Sadder was talking with the British man traveling alone who quickly abandoned his cycling trip in New Zealand. Only days into his 3 week trip when we met him, "Defeated" was on the tip of his tongue. He too felt the roads were just too dangerous for cyclo-touring. Wisely, he was changing his agenda and was using public transportation to move about the country and biking only on back road day trips. It was only about a week later when in inland Alexandra that the last piece of information finally fell into place to explain why the culture in New Zealand seems hopelessly unfriendly to bikes: injured parties have no legal recourse against drivers that hit them. This lack of legal recourse is combined with lack of legal rights: cars, not pedestrians or bikes, always have the right of way except where specifically posted to the contrary. The result is a "get out of my way" situation for anyone on the road not in a car or truck. The lack of secondary roads in most of the country leaves bikes with no where to go but to be in this legally tenuous position on the truck routes. We felt the "on borrowed time" status from the beginning in New Zealand--now we fully understood its origins. 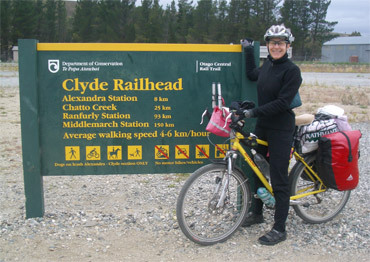 Many Kiwi's had urged us to venture inland on their new Rail Trail--a route Map Man had considered and decided against. Neither our general guide book nor our cycling book recommended the Trail and Bill's image of fighting the notoriously strong head winds on never-ending gravel sounded grim. The limited Rail Trail scenery improved as we gained elevation. But the Kiwi's were universal in their enthusiasm, the weather and wind forecasts were favorable, and the prospect of mixing it up with the truckers on the roads was in itself repelling, so we decided to give the Trail a try. We had recently abandoned our plans to ride north on the coast because of the truck traffic and so the inland Rail Trail completely out of traffic was a good fit with Plan B. 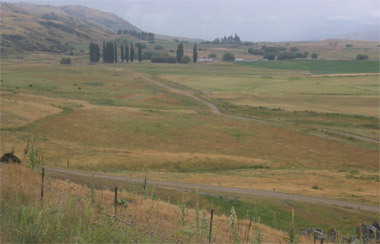 The 135 mile long Otago Central Railway was built in an "on again, off again" 40 year process that began in the late 1800's to connect the hinterland sheep operations with coastal Dunedin. The rail line was to make up for the notoriously poor roads. The line wasn't economical at that time and was only kept alive by government restrictions on how far goods could be transported by truck. The restrictive transport rules were modified in favor of the trucking industry in the 1960's and eliminated in the 1980's, ringing the death knell for this and other train lines. Bill dropped his jaw at the sight of photos showing the line using steam engines into the 1960's. 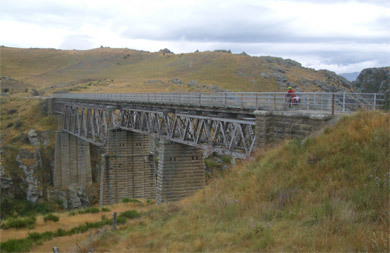 A 37 mile segment of the line out of Dunedin has been retained as an historic excursion train through the Taieri Gorge and the remainder of the line was converted to a Rail Trail recreational path in the 1990's. Not too surprisingly, we didn't think the route was in league with the 7 Wonders of the World as one Kiwi had described it, a reference point we'd heard used before for New Zealand sights. Being out of traffic was bliss, but the long, straight paths through expanses of pasture land the first couple of days was out and out boring. And the rough track was miserable going. We looked at the inches deep gravel, some of it the size of tangerines, and wondered what nut had done the spec's for the trail. The riverbed-like surface may have made the farmers feel at home, but it was a terrible surface for cyclists. We thought back to Portland where there is such a sensitivity to cyclists that even the grit spread on the roads when there is ice is selected to be bike-friendly. And then there were well constructed though unpaved bike routes we'd ridden in Europe that hardly slowed us down at all. Clearly it's not that hard to use existing materials to help out bikers, but somebody hadn't done their homework when designing this much touted trail. A hilltop panorama on the Rail Trail. One riding day we'd seen several riders bloodied up with their falls on the sharp, deep, big gravel and it wasn't an hour later that I went down too. A moment of inattentiveness and I was bruised and bleeding. Bill cleaned my wounds and was barely satisfied with closing the deepest 2 gashes without stitches. But as usual, giving these classical cyclist's leg and arm scrapes a good scrubbing right away ensured that they healed well. The next day it was tires that were the causalities of the terrible riding surface as we saw several people fixing flats. Our beefy but worn-out tires hung in there and we weren't among those taking time out for repairs. At one bend however we were cautioned to be careful as a woman had just "gotten the wobbles" and flipped over a fence. Luckily for her she flipped high enough to clear the barbed wire. A welcome good-bye to the Rail Trail. As we grumbled, we were stunned to talk with a middle-aged Kiwi man on a supported tour who was loving his Rail Trail experience. He'd been to Portland, which he thought was nice, but liked Seattle better because it looked more like his home of Auckland. He'd done some hiking and easy biking in France and Spain and just didn't think anything was as lovely as New Zealand and this New Zealand trail was lovely too. He and his group were huffing and puffing up the 2-3% grades and were among the walking wounded, but were delighted. They, like most of the riders we saw, were on rented bikes with a company shuttling their gear. His group was among those treated to lovely gourmet lunches on china dishes on the trail, which no doubt helped to keep them purring. In addition, they had evening programs adding some pizzazz to their overall experience. We saw a few other international visitors riding loaded bikes but the bulk of the riders seemed like Kiwis taking in the Rail Trail as a classical "first timer's" New Zealand activity. Most were in groups, most weren't carrying their gear, most had a tour leader, and most had catered gourmet luncheons. And now that school was back in session after the summer break, most were middle-aged and out of shape. It was a shame that this was a first cyclo-touring experience for so many and yet it was on such a grueling surface. It is the only place I know of in New Zealand where you can ride a bike all day out of traffic and away from the steep grades--too bad they didn't put a bike-friendly surface on the otherwise bike-friendly route. Famous Mt Cook was always off in the distance. 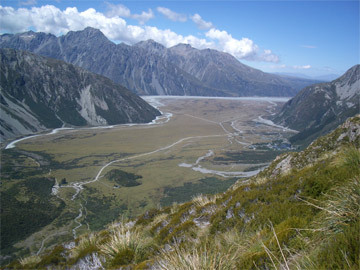 Traveling inland on the Rail Trail got us closer to checking-off Mt Cook from our "must-see" list. We'd become a little skeptical about the Kiwi assessment of "must-see's" and didn't schedule our usual 4 nights in the Mt Cook area to give ourselves 3 chances at a good weather sight seeing day. The lodging problems and our mild disenchantment put Mt Cook on a tight schedule: we were giving it a 1 full day and a 2 night stay to deliver the "wow's." The day we rode into Twizel, our layover town, the overcast skies were foreboding. The forecast had been great for it and the next several days, but the frustrated tourist info staff were to the point of doing brief comedy routines about the forecast rather than sharing the updates. The info staff did point out that for the $70NZ cost of the round trip bus tickets to the park 30 miles away, we could rent a car. Momentarily parallelized by the thought of driving on the wrong side of the road, we decided to give it a try in this very rural area. Renting the car was on the "Kiwi Simple" plan with a minimum of paperwork or formalities. Cash in advance, a signature, proof of a driver's license and we were off--he didn't even take a credit card number as a guarantee. 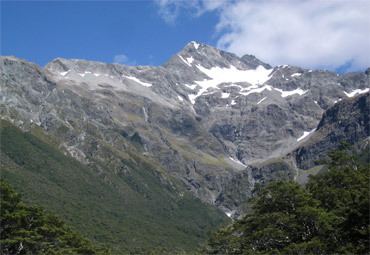 Mt Sefton was dramatically closer at Mt Cook National Park. Three months of cycling on the left side of the road was a definite help but I hadn't anticipated that almost everything inside the car would be flipped around. My biggest problem was with the turn signals as the windshield wipers lever was where I expected the blinkers to be and then the left and right directional lever's function was reversed. The low traffic volume meant that using the blinkers was more of a formality than actually informing any one and few would notice the useless flicking of the wipers at intersections. Thank goodness the 5-on-the floor shift pattern wasn't a mirror image or upside down. A flash of panic swept over me as I realized that I was going to be shifting with my left hand but it rallied and did surprisingly well at its first attempts ever of manipulating a gear box. Shifting was unexpectedly much easier than getting those blinkers going in a timely fashion. The stunning morning skies helped though in that they reassured us that the outing was going to be worth the trouble. Having the car put some ease into our day and we were able to both select a longer walk at the park and really savor the views, rather than having the familiar conveyor-belt feeling of being on someone else's transportation schedule. Blue skies, great visibility, and gentle winds made for a delightful hiking experience. We were even treated to the sight of several small avalanches a reassuring distance away. The thundering sounds of avalanches were often only minutes apart, though few were seen. And unlike after our big hike on the Tongariro Crossing 2 months earlier, we actually were able to admire the mountains the next day as we rode out of the area. We savored our picnic lunch with photogenic Mt Cook as a backdrop and we immensely enjoyed extending the mountain view experience. The nearby gift shop had a postcard stuck on the window with a sign stating that the postcard view was what the mountain looked like from there when the weather was good, reminding us that we were among the lucky ones to have been there on 2 good viewing days. Looking back down to the valley floor from where we began. 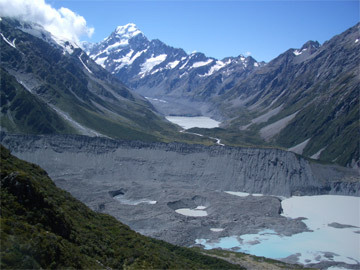 Since most visitors to New Zealand are coming for outdoor activities or panoramas like at Mt Cook, the weather is pivotal in coloring their experience. But the weather is wild in New Zealand and that fact is underscored by the language around it. In drizzly Oregon and Washington, our weather hopes are often for a "warm, clear, sunny, or dry" day but in New Zealand, the Kiwi's and their meteorologist's hope for "settled weather." And once the weather settles, you hope to be among the lucky segments in the country getting "fine" weather. After over 3 months of unsettled weather, we finally experienced it and "settled" seemed for most to be synonymous with "summer's finally arrived." What the settled weather actually looked like varied with where you were. In coastal Christchurch where we were when the weather settled for several days, that "cracker of a day" meant cool, overcast mornings and evenings sandwiching warm, sunny afternoons. Inland on the South Island, the same system brought hot, dry days and for less fortunate and more southern Invercargill, everyone else's settled weather brought them endless cloudy, damp days in the high 50's. It was the middle of the equivalent of the Northern Hemisphere's August when the weather finally settled, underscoring a visiting Japanese meteorologist's assessment of New Zealand as being in perpetual spring. For us, the long awaited settled weather meant relief from the vicious winds that could pop up any day and the icy cold Antarctic winds that had us layering on heavy clothes in places where we should have been sweltering. Of course, we weren't sorry to miss the searing heat that is possible when inland, but putting on the heavy mittens and long johns in what is usually the notoriously hot spot of the country, Alexandra, had been quite the disappointment. New Zealand's winters being less harsh than the winters in Europe was part of the marketing campaign in the 1800's to lure Brit's to the new colony. It was true, New Zealand doesn't get the harsh winters of Europe, but like us, the new arrivals quickly cursed the fierce winds and forever unsettled weather. 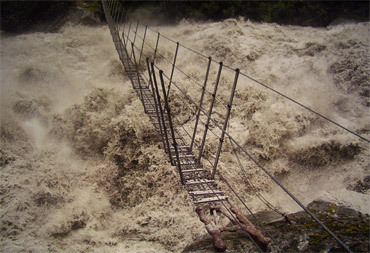 New Zealand's modern weather records include 16" of rain in 24 hours and 52 feet of rain in a year in another location. And subsequent flooding and landslides from those kind of rainfalls are still ordinary occurrences in New Zealand like they were when the colonists arrived. But despite what felt like a bit of connivery to the colonists, they remained loyal to Britain. The celebration of National Lamb Day on February 15th reminded us again of the factors that continued to cement their ties--a much different path than was traveled by the US colonists. It was 125 years ago from National Lamb Day in 2007 when the first refrigerated sailing ship headed off from New Zealand on its 100 day journey to Britain with frozen lamb carcasses. That first ship slipped out of the country without fanfare or a photo as the fear of failure drove the sponsors to keep a low profile. The first cargo arrived in fine condition and New Zealand only sold its lamb meat to Britain until the 1960's. Then Britain began distancing itself from the Kiwi's because of warming up to trade agreements with France and Germany that preceded the formation of the EU--a situation that created economic chaos in New Zealand. The frozen meat business was one of many products that led to New Zealand long being considered a distant, European farm and was a major food supplier to Britain, especially during the World Wars. Other little things keep reminding us of the strong ongoing ties to Britain, like the fact that there are more bag pipe bands per capita in New Zealand than in Scotland. New Zealanders were simultaneously content to remain tied to Britain and yet wanted a separate, additional identity too. Participation in the Great War was seen as a way to establish that identity and it continued into WWII. We were stunned to read that two thirds of New Zealand's men aged 18 to 45 served in WWII, with a high percentage being willing Maori. In New Zealand, as in Europe, we stopped to read the war memorials as we quickly learned in Europe that the various treatments of the memorials gave us additional insight into the host country's culture and gave us a way to compare cultures. New Zealand's WWI memorials are unusual in that after listing the men killed in action, the men who returned are listed with the same honor, underscoring the value attached to demonstrating their loyalty to Britain. Our next big stop on the east coast was at Christchurch, a city that promotes itself on billboards around the South Island as being the most British city in New Zealand. It was from Christchurch that we would launch for our last "punch on our New Zealand activities card" by taking the TranzAlpine train from coast to coast over the Southern Alps. But it was there that we discovered we'd received our first really erroneous tourist information for our entire New Zealand visit. The bus route took us over the passes & close to the peaks. We'd been reassured weeks ago that no advance bookings were necessary for the scenic train trip, especially since we'd take it on a week day. Confidently we waltzed into the Christchurch train station on Sunday afternoon to buy our tickets for the next morning only be told that weekdays were their busiest days and that it was booked for the next 4 days. But we had scheduled 3 full days in the city to pick the best weather day for the journey once we arrived, not the needed 5 days. The newly arrived settled weather was expected to be grand for the next several days, magnifying our sense of lost opportunity. We cashed in on our several months of experience with the service sector in New Zealand and in being in an English speaking country where we could easily access information and 2 hours later, after a lot of scrambling, we had resurrected our trip for the next day. 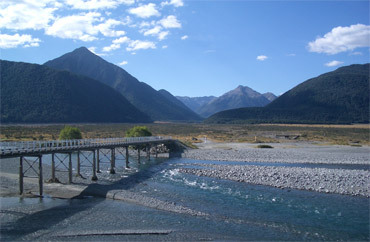 Instead of making the standard once daily train round trip from Christchurch on the east coast to Greymouth on the west coast and back again that day, we'd ride the shuttle bus to Greymouth in the morning and take the train back to Christchurch in the afternoon. The new compromise plan had several points in its favor. First, there was the substantial price savings as the bus was priced as transportation whereas the train was priced as a tourist event, resulting in the bus being 1/3 of the cost of the train. And though they traveled similar routes, they weren't exactly parallel, so our more complicated itinerary would possibly create very different experiences over the Southern Alps. The end of the day grumblings of a very disappointed man who had done the round trip train ride the same day we traveled reinforced that our 'second best' plan was likely the best plan of all. He complained that the train ride terrain wasn't at all alpine, that it was not very scenic, and that he had unfortunately done it twice. We on the other hand had had 2 very different trips. The train kept to lower and flatter terrain. If I was only going to go one direction, I'd probably do the trip by bus as the overall experience was more dramatic than the train. The sometimes very narrow, windy, up and down road gave a more representative experience of the mountainous terrain and 16% grade road through a gorge that the train bypassed in a tunnel was stunning. The bus driver gave lots of commentary along the way and stopped several times for photos. And unlike the train, the bus crested the 2 high passes over the mountains rather than bypassing them. 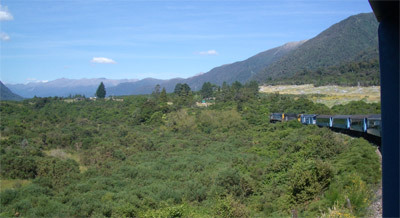 The train cheated its passengers out of some stunning views by spending miles in tunnels to avoid the highest points. But the more pleasing, up-close look of the plains vegetation from the train on the west side was much more interesting than the roadside view and the train did make a long traverse of a steeply carved river gorge. But even with those features to redeem the train ride, the bus vantage point was better overall. As we had guessed after having few options, our itinerary of taking the bus first and the train second was a perfect match with our traveling endurance. The small bus's seats were uncomfortable for the 5 hour ride and it became very jostling towards the end as the driver tried his best to make up for being a half hour behind schedule. We were glad to have done the more tiring though more interesting ride in the morning when we were fresher and feeling more adventurous. The smoother ride, bigger seats, and vast windows on the train were perfect for the return trip for which there was less excitement and anticipation to counter our growing fatigue. Like the grumbling tourist we overheard, we too thought the coast to coast trip was over-rated. It was pretty and it was a nice overview of the land that we'd seen on our South Island stay, but its hard to say it would have been worth the $130US we'd each spent had we done both legs by train. It was however a thrill to cover so much terrain under blue skies of the spell of settled weather--a first for our 3 and half months in New Zealand. It was competition with the Salvation Army conference attendees for lodging in Christchurch, by far the South Island's biggest city, that edged us farther from the center than was comfortable for us. We were pleased to get a nice motel room for our 4 night stay, but the too long-walk in for groceries and visiting the sights was a disappointment. It had me reminiscing about smaller and more compact Dunedin where the same activities took less time and effort. Making the run on the TranzAlpine rail line was the main event for our Christchurch visit and with that behind us, museum time was next on the list. As we were winding down on our New Zealand stay, I had a short list of topics I hoped Christchurch's museum would cover to answer some lingering questions and it did a superb job on 1, which was Antarctica. Museum diorama of Scott's late & doomed final push to the South Pole. Antarctica had hardly been a lifetime fascination of mine, but feeling those bone-chilling winds coming from thousands of miles away in what should have been the dog-days of summer had piqued my interest. And while we were in New Zealand, a few Antarctic icebergs had drifted by, though not where we could see them. TV news stories and museum exhibits ensured that neither Antarctica or Australia were ever far from our minds when in New Zealand even though they were physically a long ways away. We had plans to visit Australia but Antarctica would be the harder one to learn about once we left New Zealand. Luckily for me, Christchurch had been selected as the launching point for several of the early 20th century polar explorers and their stories and left over gear formed the nucleus for the museum exhibits. Reading the tales of their trials on the frozen continent was interspersed with great details on the weather, the ocean currents, and the geology--all things that directly or indirectly affect New Zealand. Antarctica, like New Zealand, was a part of the ancient super continent Gondwanaland, so learning more about Antarctica helped to fill-out New Zealand's story too. And the short spell of fine, settled weather made stepping out for breaks from museum exhibits into Christchurch's adjacent botanical garden a delightful treat. Christchurch was the end point of our almost 4 month biking trip in New Zealand and our way back to Auckland's airport would be by bus, ferry and then a train ride north for most of the length of the North Island. Though the biking in New Zealand hadn't been the stunning experience we'd hoped it would be, it's always sad to wrap-up the biking part of our travels. When the bikes become urban luggage carts, the pace quickens and the calendar and clock rule our lives. And knowing full well how quickly the weather can become severe in New Zealand, we'd left plenty of time for delays so as to keep on schedule the next week. Our travels have taught us that we create much of the stress in our lives and in our quest to break that habit, we've learned to build more ease into our schedule the last few days before flying to Portland. Generally the worry is human created obstacles, like labor strikes in Italy, seemingly unknowable holidays in Spain and Greece, and ordinary gridlock in transportation systems in other places. In New Zealand, it was clear that the more likely threats to our schedule would come from the wild as New Zealand seems to be where Mother Nature kicks up her heels in the biggest ways. Back in November when we planned our return to Auckland from Wellington by rail, we were most concerned about wind delays in crossing the Cook Straits between Picton on the South Island and Wellington on the North Island. The trip that used to take up to a week by sail should only take 3 hours, but Wellington seemed vulnerable to gale force winds almost any day of the year. The usual ferry delays are measured in hours but since the recent worst spell was a 3 day hiatus in service, we cautiously scheduled 4 nights in Wellington before planning to catch an early morning train to Auckland. Photos of extreme events are everywhere in New Zealand. Scheduling an early ferry from Picton gave us several more chances of catching a later ferry that day if there were delays, but the 3 extra days to get to Wellington were serious insurance for making our train and then flight. And just to be sure, we scheduled 2 nights in Auckland to give us an extra shot at making the once daily, 12 hour train trip to our departure city. I often claim that when I'm right about something that it is often for the wrong reason and building in all of this buffer to our itinerary began looking like another "right for the wrong reason" situation. Our bike tour of the North Island had taken us past the 1953 memorial to the train passengers who died in the lahar, or mountain mud flow, that undermined a bridge minutes before the train was to pass over it. We knew then that our February train would be crossing the rebuilt rail bridge. We inspected the lahar gates to close the road to traffic when the next "big one" came and assumed the train also benefited from an early warning system. Since then, we learned that the authorities were on round the clock lahar watch as the conditions were ripe for another sudden flow of muck down the mountainside and our travel date was within the predicted window for the massive landslide. We intensified our efforts to find updates on the lahar threat to monitor its effect on our transit, though it wasn't easy to come by that information. If wondering about the winds on the day we crossed The Straits and joining in the lahar watch weren't enough, a week before our flight from Auckland, the city had a series of 3 earthquakes, the largest being a 4.5. The quakes weren't enough to inconvenience anyone, but their occurrence just underscored New Zealand's extra sources of chaos to one's schedule. 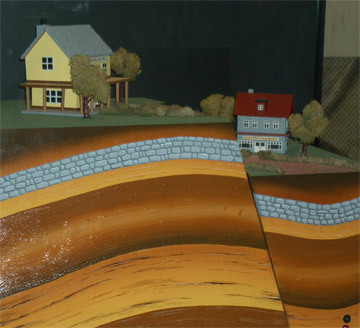 Earthquakes are a daily affair in New Zealand, which is about the size of Colorado, but most don't make the evening news. Luck was with us as we crossed The Cook Straits 2 days before the weather became unsettled and monster winds whipped over Wellington. Not needing our 3 day buffer for foul weather on The Straits left us with some welcome city sightseeing time in the capital. We'd tried and failed in France and in Wellington in December to do a city tour on a Segway 2-wheeler and our extra time in Wellington in February would give us a second chance. Of all of the "first timer" activities we'd seen or tried in New Zealand, this was the only one that had piqued my interest years ago. It was a surprise each time we saw them advertised in a city and each time they had been unavailable for one odd reason or another--it was never something we could maneuver around, like a lead-time problem. But everything worked like clockwork this time around and the Segway adventure was ours. Ironically, this American made device delivered our most delightful activity in New Zealand. Kayaking, rock climbing and other outings had left us longing to do them again but with no desire to invest in the equipment. 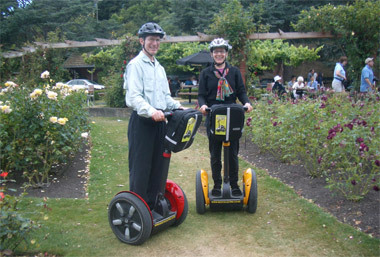 However, within minutes on the Segway, we were both saying "I want one!" We got comfy on the effortless & fun Segway's too quickly. They were way-cool to ride and grab any opportunity you get to take a spin on one. They are zippy and fun to operate: a tilt forward or back with your torso controls your speed and front-back direction and a twirl with your left hand allows you to make turn-on-a-dime 360's to the right or left. You glide around like you are floating on a cloud and the effortlessness of it makes the mind run wild with possibilities. Like any new activity, especially involving speed, they did generate some sweaty palms, but it was worth the bit of stress. Our host ran us through his well-practiced introductory routine at preset low speeds and then upped the speed available and challenges as we gained confidence. Skiing experience years ago and our thousands of miles of biking clearly added to our comfort on them but he assured us any one can operate the electrical 'mobility devices'. Like in other cities where we'd seen them advertised, the Wellington package was a city sight seeing tour combined with a Segway adventure and so we were soon in the midst of other tourists. We navigated through doorways, up steep hills, over grassy fields, across broken pavement and down shallow curbs as we glided along 7-8 miles of pedestrian areas. Even though twice daily tours are offered, our trio generated lots of stares and plenty of grins. We felt a little bit like an advertisement for a circus act as we cruised through the crowds but only had time for quick waves as we concentrated on navigating our new toys. By the time our almost 3 hour outing was over we were both tired and exhilarated and hoped to ride one again. I was thrilled to check an item off my short list of "Things I hope to do someday." Our 3 "just in case" days in Wellington were easily spent with a half day for our Segway adventure; a full day strolling through the hilly botanical garden with long stops for reading; and visits to 2 museums. Our exercise level was dropping precipitously, but at least we were finishing up the heavy books on New Zealand's geology, weather, and history that we didn't want to drag home. On one measure, that of reconnaissance, our trip to New Zealand was a failure. We are in search of a place to winter-over during the Northern Hemisphere's cold season: a place warm and dry enough that we will be motivated to go out for daily bike rides without always being on the move. A place where we might stay put for a week or a month and get to know an area better while escaping the cold, damp weather of the Northern Hemisphere. Snow in Greece and cold, windy days in southern Spain checked them off the candidate list and we had hoped that New Zealand would be the winner. But we learned the hard way that New Zealand is too vulnerable to severe, year-round storms and the small roads are too heavily traveled by trucks for it to be a pleasant winter-over, biking venue for us. 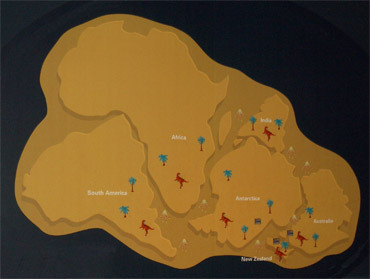 The super-continent Gondwanaland 130 millions years ago. On the most superficial level, I now understand that the similarities between Australia and New Zealand stop at them being neighbors in the Southern Hemisphere and both having been British colonies. The sizes of their land masses, their geography, their climates, and all the subsequent natural history are wildly different. It's not a pairing like the US and Canada and it's only taken visiting one the 2 countries to see their vast differences. And a forever slippery bit of the earth's early history--that of the break-up of Gondwanaland--is now firmly in my grasp. It used to be a vague starting point for a continuum of continental movement and tectonic plate theory, now its transformations provide explanations for less theoretical things that I have seen for myself. The pressures from competition were always driving forces in what I studied about evolution and in New Zealand I looked at the evolutionary process from the other direction--from the extreme lack of competition because of the lack of predators. Many of New Zealand's oddities like giant species and flightless birds evolved because of the complete absence of pressures on their daily lives from predators. Being in New Zealand gave me a greater appreciation of the accomplishments of the ancient Polynesian mariners. There is just nothing like being at a historical place to deepen the understanding of events. It's one thing to sit in the US and look at the far corner of a map and say "They sailed from over there to over there." It's all so remote that it has little meaning. But sitting in New Zealand and looking at a map and saying "They sailed from there to here" adds substance to the image. And one can more deeply internalize the significance of it all when in addition to the map you are seeing life-sized replica boats and their marine charts of ocean swells made from sticks and shells. Yellow-eyed penguin heading to the bush for the night. Exposure to the ongoing struggle between the descendents of the Maori and the European settlers gives me a new way to comprehend the issues surrounding the integration of non-metal cultures into the post-industrial world. I certainly have no answers, but I understand the problem in a deeper way since learning about the drama playing out in New Zealand for the last 150 years. And then there is the correction of misinformation that has occurred from being in New Zealand. I used to think of penguins and I thought "ice". Well, not any more. 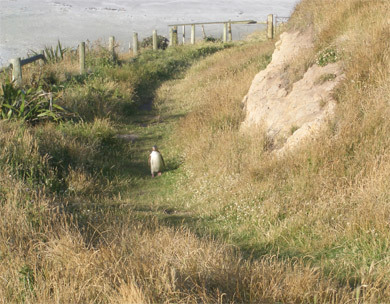 In New Zealand the little guys waddle across the road at night to sleep underneath somebody's house or in the bushes. And I've gotten straightened out about how different the Arctic and Antarctic are in terms of size, temperatures and their global effects--a confusion similar to that from inferring too much from the pairing of Australia and New Zealand. And on a more practical level, I've learned that it is possible to boil pasta in a deep-fryer pan filled with water. We had a glorious day visiting the Mt Cook area and were thrilled to stumble into exceptionally fine weather for seeing the sights in that area. We were especially pleased as it was our second to last weather dependent outing, and we felt lucky to have actually seen so many major sights during this unusually cold, wet summer in New Zealand. Being at the Mt Cook visitors center also allowed us to close a small, somber chapter in our New Zealand experiences: we confirmed that one of the 2 Japanese climbers that died in an accident on Mt Cook in January was indeed the young woman we had spoken with shortly before the tragedy. It was one of dozens of casual traveler's conversations with strangers; a brief swapping of "Where we've been, where we're going." 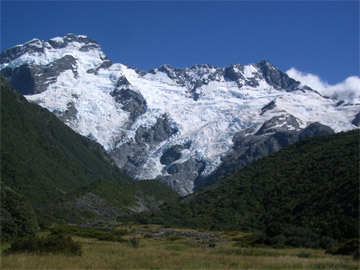 We had noticed the climbing helmets in the back of her car and she shared her anticipated 3 week stay at Mt Cook Village. Her mother was traveling with her and they had spent the night in the adjacent motel room out in the middle of nowhere on the west coast. A loose bond was formed, that of being adventure tourists laying over in the same isolated place in a foreign country though for very different reasons. We were both heading to Mt Cook but they would arrive weeks before us. They honked and waved as they drove past us the morning we all departed the motel. We'd heard about the freak accident on the TV news and rung what details we could from the newspaper account. Her age, the timing of the accident, the rendezvousing with climbing friends traveling from Japan all fit with it being her but we didn't know her name. I had hoped when we visited Mt Cook that there would be a posting in the visitor's center to tell us more, but there was no mention anywhere of the accident. Fortunately, a young Kiwi staff member who was also a climber obliged us by comparing known information with us and the stories matched--the unlucky climber was most likely the woman we had met. It was sad to know it was her but it was better than to be left wondering forever. It was one of those odds experiences we all have, one of those little brushes with death that remind us that it is never far away from any of us. It was also a reminder of how our lives ripple far beyond what we imagine. There is no way that her mother whom we met will know that those 2 graying American cyclists were marking the passing of her daughter in their own way. There is no way that her family will know that the memory of their daughter will be permanently woven into the fiber of our New Zealand memories. Her smile will flash on the screen in my head whenever Mt Cook is mentioned and they'll have no idea. Despite the sad loss of the 2 Japanese climbers, we will remember New Zealand and the Kiwi's for excelling in offering outdoor activity packages and we will cherish the memories of ours. We had a number of "firsts" while in New Zealand. We had our first walk down into a recent volcanic crater near Rotorua; our first walk with crampons in the crevasses of a glacier; our first outdoor rock climbing experience; our first Segway ride; and Bill had his first kayaking experience. We also will remember the opportunity to do the one-way Tongariro Crossing on the North Island with its stunning views of old volcanic activity. The things we'll miss when we leave New Zealand: the nice, laid-back yet competent people; the interesting vegetation mixes; the wonderfully comfortable motel rooms with kitchens; the ready availability of inexpensive washing machines at the motels; Vogel's Toast-Sized Pumpkin Seed with Mixed Grains bread from the grocery store and those yummy, 250g Whittaker's 62% Cacao Bittersweet chocolate bars. One harsh reality when we return home will be giving up our New Zealand chocolate binge. Our weight-loss campaign of last summer was a success and through the upsets of routine changes in going home and then traveling to New Zealand, we were pleased to have kept the pounds off. The embarrassing surprise was that our consumption of chocolate doubled to tripled while in New Zealand. It was a combination of factors that lead to this, with temptation being a major one. In Europe, our favorite brands of bittersweet chocolate came in convenient 100 gram bars, or about 3 oz. We'd split 1 compact bar for dessert at lunch and have a satisfying and yet moderate amount--and no leftovers. In New Zealand, the local bittersweet brand we settled on came in monstrous 250 gram bars, always leaving a temptingly open package in the lunch box. And we could only buy this particular chocolate every few weeks, so we quickly learned to stockpile it by the pounds. When we've had a hard riding day, we are accustomed to making up the missing calories by heavily indulging in fresh fruits and vegetables, but they weren't so handy in New Zealand. The quality, variety, and freshness tended to be low and the prices were high, all of which kept our inventory low. In addition to that, we often couldn't buy food daily and the bulk, weight, and perishability of produce meant that our standard fresh snacks were in short supply. As a result, dipping into the chocolate inventory became the obvious and easy way to make up the needed calories. The good news was that those grid-like patterns in the chocolate bars made it easy for us to count calories, so even though we were making up our calorie shortages on nutritionally empty calories, at least there was no confusion about the extent of the indulgence. Ending our riding in Christchurch 10 days before flying home meant that our need for extra calories evaporated early and we had to be firm with ourselves to taper back down to our usual chocolate ration even before we left New Zealand. Hoping to leave Auckland before one of these hit. The very rough and jarring 13 hour train ride from Wellington to Auckland scooted through the precarious lahar area without a hiccup. One diesel engine fizzled just out of Wellington and overheating of the tracks in the high country furthered slowed us, but we made it into Auckland only an hour behind schedule. After a surprisingly tiring day for a first-world train ride, we were glad to still have our extra day in Auckland to recover before heading out for the rigors of air travel, including a 9 hour lay over in LA. We are currently in our 24 hour air travel interval to return home where we'll be re-outfitting for cyclo-touring season #7. We have tickets for Frankfurt on May 10 and Bill has another adventure roughed out for us. We are thinking about leaving our bikes where we touch down, in Frankfurt, and then going north by train to sleep off jet lag in Copenhagen for a week or 10 days. Rested and clear-headed, we'll head out on our bikes from Frankfurt in late May. Our brief visit back home last October didn't leave us time for visiting with friends, so we are looking forward to catching up with everyone on this round. I've developed a bulging cyst in my left calf that looks like it will have to be professionally removed, so that is likely to slow me down (and make me cranky) for a few weeks. Bill's overhaul plans are for the bikes and not his body, and they are in line for major maintenance work: new tires, new drive trains, new brake levelers, and some other odds and ends. Bill is also hoping all of our electronics will hold together for another year, making fewer hassles for him this time around. Once again, our laptop will have to be mailed off for repairs, which is always a major inconvenience. I don't anticipate updating our webpage until after we are on the road again in May, so you won't be hearing from us until then. You are always welcome to email and if you need a cyclo-touring hit, we have a half dozen new SideTrips on the webpage to entertain you.